It’s finally here! For months, I’ve been thinking about and planning this video series, and it’s finally here! Well…half of it at least. 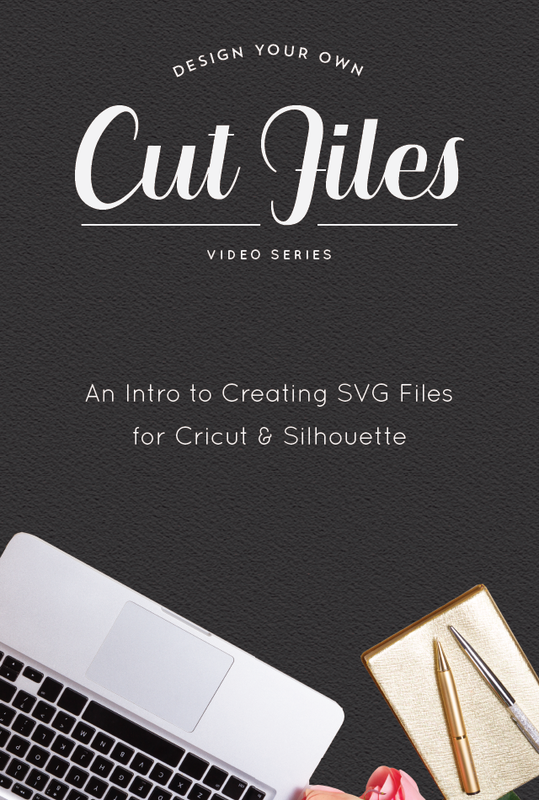 The second half is coming soon; but, until then, I just couldn’t wait to announce the launch of my very first video series: Designing Your Own Cut Files. Learn all the tips and tricks you need to know for bringing your crafty, creative cut file ideas to life! When I bought my Cricut, I was so excited to be able to create my own, custom cut files! There was just one problem—I had never designed cut files before, and I couldn’t find any instructional videos on how to do it…at all! I decided to give it a go anyway, and, through much trial and error, was able to figure it out. Shortly after my new discovery, I decided to share my newfound knowledge with people who had been in the same boat as me. I created a simple tutorial video, and, sure enough, I wasn’t the only one trying to navigate the complex waters of SVG file design. Soon, I was flooded with questions about issues people were encountering and minute details that I hadn’t addressed. Answering people’s technical design questions without seeing their screen can be quite tricky, though. That’s when I decided that this was a topic that warranted not only one little video, but a whole series dedicated to it! And thus, Designing Your Own Cut Files was born. IMPORTANT NOTE: In all of these videos, I’ll be using Adobe Illustrator (the premiere software for graphic design) to create my SVG files, and then bringing the designs into Cricut Design Space. You can also use SVG files in the Designer Edition of Silhouette’s software (Silhouette Studio). I’ve broken up the material into 10 videos that work through simple cut files and gradually build up to more complex SVG design techniques. The first 5 videos are currently available for your viewing pleasure. Now that your mind is jam-packed with cut file design information, it’s time to practice practice practice! Once you start designing SVG cut files, the rules become engrained in your mind (hopefully you hear my voice on repeat saying, “Make it into one compound path.”). Enjoy these first 5 videos! If you have anything you’d like to learn that I haven’t covered yet, be sure to let me know, and I’ll see if I can work it into one of the next videos in my series. This is exactly what I need!!! I want to be able to design my own graphics to use with the new Cricut Maker BEFORE I buy one!!! Thank you so much!! Glad you’ve liked my videos so far!! This tutorial is so cool. I did not even know this was possible. Thanks for the tutorial. Hi! Just a beginner SVG’r from Logan, UT and have looked everywhere for this. Seems like a lot of people are tight lipped about this. Thank you, Thank you!! You are the best! Maybe we can meet in person some day. I don’t currently have a tutorial about using the Offset Path tool in Illustrator, but I can definitely make one—great suggestion! Thank you so much for your videos!! They are so helpful and you do such a good job explaining. Do you have a tutorial on what settings we need when we save. When I save, it asks for font subsetting or image embedding. Can’t find help for that online. I was using Adobe CEF under font type, but when I opened in Silhouette it was setting cutline around the file, not the design. Thank you! I’m glad you are finding my videos useful! I don’t currently have a video about the precise settings I use when I save, but, for SVG file, I’ve always just used the default settings. As far as issues with fonts go, you’ll need to change all of your type to outlines before you save your file. Otherwise you’ll have trouble when you upload it to the cutting software. Regarding images, you shouldn’t be using images in SVG file designs, but I almost always recommend embedding your images when you’re working in AI (simply select the image and press the “Embed” button in the toolbar).